Danus Artellian is an Imperial guard, and Captain of the Skingrad Castle Guard. Most of his time is spent in the barracks or checking up on his troops in the castle guard, but a few items in his schedule stand out. He sleeps in the castle barracks from around 10pm to 6am, and 10am to midday on Sundas sees him worshipping in the Great Chapel of Julianos. Danus takes his meals with the castle's day shift, eating lunch from midday until 1pm and dinner from 7pm to 10pm each day in the barracks. Outside those times, he can be found patrolling the castle in either the courtyard, dungeon, south hall, main hall or barracks. These patrols are random, so it is impossible to say exactly where he will be, although the courtyard and barracks are most probable. 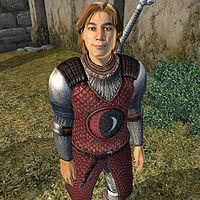 Danus wears a Skingrad Cuirass with steel boots and greaves, and wields a silver claymore. He also carries a few gold coins and keys to the main castle and its inner chambers. Additionally, Danus carries a random lower-class outfit, which he uses when he sleeps. He is rather haughty and makes a point of telling people the difference between his duties and those of his colleague Dion. When asked about Skingrad he will say, "I'm captain of the Castle Guard, and Dion is captain of the town guard. It's simple. I don't care what goes on in town... that's Dion's problem." His ego isn't lost on the citizens of Skingrad, and they all disagree with his self-assessment: "That Danus Artellian is a little too full of himself. Sure, he's a Captain of the Guard, but I'm not impressed. ", "I can't stand someone who's so full of himself. Someone needs to teach him a lesson. ", "I don't think he's that impressive. There's no telling him that, though." and "I don't like that Danus Artellian. He's a bit stuck-up for my tastes." are the kind of comments that people will make about him. Esta página foi modificada pela última vez à(s) 05h22min de 20 de outubro de 2015.